The Bay Area Orienteering Club is holding the 2004 Western States Orienteering Championships at its annual Tahoe A meet. 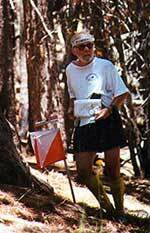 The Western States Orienteering Championships has a long tradition reaching back 20 years. On Saturday, June 5, we will be visiting Fallen Leaf Lake, site of the 2003 U.S. Orienteering Championships, and on June 6 we will be at Spooner Lake, site of the 1999 U.S. Orienteering Championships. Both sites are near the southern part of Lake Tahoe. Please check the recently posted event notes for the latest information. THIS EVENT IS FOR EVERYBODY! It's for competitive and non-competitive orienteers. It's for experienced, intermediate, and beginning orienteers and adventure racers. It's for families and individuals. It's for people of all ages. It's for you! USOF-sanctioned courses (white through blue) for all USOF A meet classes, along with ranking points for all USOF members. The A meet will be a two-day combined time event with standard classic courses both days. Recreational courses (beginning/white through intermediate/orange and adventure racing/long orange) for groups, families and less competitive orienteers. Try a course either day, or both days! Clinics for beginners and adventure racers. Western States Championship awards to first place finishers among eligible participants in all A categories. To be eligible, as of May 1, 2004 you must be a USOF member and either have a primary membership in a western USOF club or have your primary residence in a western state (Alaska, Arizona, California, Colorado, Hawaii, Idaho, Montana, Nevada, New Mexico, Oregon, Utah, Washington, Wyoming). A meet awards to first, second, and third place finishers in all USOF A meet classes, regardless of USOF membership or place of residence. The A meet is a BARE BONES event, meaning that there is no event T-shirt, no model or training event, no organized child care, no official Saturday night dinner (although an unofficial one is likely to be organized - stay tuned to the BAOC website), no official event hotel. Fallen Leaf Lake is administered by the U.S. Forest Service. The terrain is partially open meadow and highly runnable forest, and partially slower forest with thick vegetation. There are a multitude of pits, fallen trees and boulders in some areas. 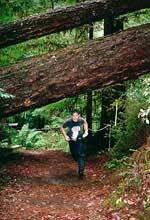 There is a good network of trails for the recreational and less advanced competitive courses. The map was field-checked and drafted by Zoran Krivokapic in 2002. We will be using the eastern portion of the Spooner Lake map (where the lake is), which is part of the Nevada state park system. The terrain is relatively flat around the lake, with a good network of trails, but steep elsewhere. Most of the map is typical Tahoe runnable forest, with some clearings, meadows and rocky promontories mixed in. The map was field-checked and drafted by George Kirkov in 1998. For all courses both days, the scale will be 1:10000 with 5 meter contours. You may order either the Fallen Leaf map or the Spooner Lake map (or both) from the event registrar for $3 per map. The climate in early June is most likely to be sunny, with chilly nights warming up quickly when the sun rises. Expect high temperatures in the range of 61 to 73 Fahrenheit (16 to 22 Centigrade). There will likely still be patches of snow, depending on the snow pack from the previous winter. The biggest hazard at this event is likely to be the altitude. You will be competing at 6200 to 7000 feet. There was at least one case of altitude sickness at the 2003 U.S. Championships at Fallen Leaf Lake. The best strategy to cope with altitude is to stay hydrated. There is no poison oak, no rattlesnakes, no ticks with Lyme disease. There are bears, however they are unlikely to be aggressive. Another possible hazard, particularly at Spooner Lake, is homo bicycletus, otherwise known as the Mountain Biker. Stay alert on trails. Whistles must be carried by all participants, both competitive and recreational. If you don't have a whistle, ask for one (for free!) at registration. F21E and M21E are the open elite categories for women and men. They are open to competitors of any age. Categories with + are A categories open to competitors of that age or greater (example F-50+ is open to women of 50 years or older). Categories with - are A categories open to competitors of that age or less (example M-10- is open to boys of 10 years or less). Categories with a course color (eg M-Green) are open categories for any competitor, regardless of age. They are not A categories and are not eligible for the Western States Championships. In addition, recreational White, Yellow, Orange and Adventure Racing courses will be offered both days for non-competitive individuals, families and groups. SportIdent electronic punching will be used for all A meet courses. Manual punch card punching will be used on recreational courses. If you do not own a SI card, you may rent one for $2.00 per day. Please indicate on your entry form the number on your SI card (if you own one), or whether you need to rent one. Adult members of USOF or another national federation belonging to IOF receive a $3.00 per day discount on entry fees. Juniors (18 or younger) who are members of USOF receive a $1.50 per day discount. You may also register for this event online at Active.com, which charges a small additional fee. No preregistration is necessary. Standard BAOC event fees apply. White and Yellow cost $6.00 for the first person in a group, and $2.00 for each additional person. Orange costs $8.00 (BAOC member) or $12.00 (not a BAOC member) for the first person in a group, and $2.00 for each additional person. Juniors (18 and under) are half price. South Lake Tahoe is blessed with a multitude of motels, casino hotels, ski chalets, and bed-and-breakfasts. Early June is off-season, so rates should be reasonable and availability should be good. A good website to find lodging is www.tahoe.com. Registration will be open Friday evening, June 4, from 5PM to 10PM, at the High Country Lodge, 1227 Emerald Bay Road (also known as US Highway 50). From South Lake Tahoe, go west on US 50 through interminable stop lights to the "Y" intersection with Route 89 and turn left (south), staying on US 50. High Country Lodge is on the left about 1/2 mile after the "Y". If you pass the airport or start gaining elevation, you have gone too far. From the Bay Area and Sacramento, take US 50 over Echo Summit and descend to the Tahoe basin floor. High County Lodge will be on the right about 1 mile after the South Lake Tahoe airport. If you see the "Y" intersection with Route 89, you have gone too far. Registration will be open Saturday, June 5, from 9AM to noon. Parking will be at the Snow Park just west of the Fallen Leaf Campground on Route 89. From South Lake Tahoe, go west on US 50 to the "Y" intersection with Route 89 and turn right (north) Go approximately 4 miles to the Snow Park on your left. If you see Tallac Trailhead Road, you have gone 1/2 mile too far. From the Bay Area and Sacramento, take US 50 over Echo Summit to the "Y" intersection with Route 89 and follow directions above. Registration will be open Sunday, June 6, from 8AM to noon. Parking will be at the Nevada Highway Department lot just north of the intersection of US 50 and Route 28. From South Lake Tahoe, go north on US 50. After about 14 miles, turn left onto Route 28. Make the first left into the parking lot. From Truckee, take Route 267 south to Kings Beach. Turn left onto Route 28 east. After about 18 miles you will see the entrance to Spooner Lake State Park on your left. The parking lot comes up shortly after on your right, before the intersection with US 50.